It was a season of oddities, historic moments and crazy events for the Missoula Osprey in the 2012 Pioneer Baseball League season. Little did anyone know that the team that took the field in mid-June would be celebrating a title in Utah in mid-September, all while the club set a new single-season attendance record on their way to their third title in their 14 seasons in the Garden City. That celebratory act, however, is where Andy Green's charges found themselves, playing their third winner-take-all game in eight days, and finishing it off with their third celebration of a win in such games. That 10-0 win over the host Raptors in Game 3 of the Pioneer League Championship Series was recognition as much for the road the Osprey had traveled as much as the performances both on the mound and at the plate. The finale would be the least climatic game of the 45 wins the O's would collect during the summer of 2012 - even the 20-0 win over Helena on June 27 had drama for a good bit of it, between Danny Pulfer's pursuit of a cycle and the pitching staff twirling a three-hit shutout - but would include the latest "did we just see that" moment when Socrates Brito, after catching the final out of the game, launched the ball over two buildings behind the right field wall at Lindquist Field and onto the adjoining street in a moment of celebration, with the final out now likely residing in a young person's glove ready to use next spring. Consider the moments which the Osprey experienced on their road to the title - some of which was seen by an Osprey single-season record 89,812 fans: - The first defensive walk-off win on the road after the other team homers to tie the game, thanks to Raul Mondesi, Jr. missing home plate and catcher Michael Perez noticing it, along with the home plate umpire. Your odd-ball stat of the season: The Osprey were 2-for-4 in 2012 on base-touching appeals on home runs (Odgen shortstop Corey Seager was the other victim). - Pulfer's cycle, the first for an Osprey player since Jimmy Principe cycled against Ogden in 2007, came after a disastrous start to the season for the veteran infielder. Pulfer opened the season 0-for-13 before his 4-for-6 barrage against Helena pitching in what turned into a 20-0 Osprey win. - After spending much of the year losing every game they trailed from the fifth inning on, watching as the Osprey rallied from a 5-1 deficit in the fifth at Orem, then the most dramatic rally, down 9-0 to Billings on August 11 only to score an 11-10 win. That was also the night the Osprey defensively walked off in dramatic fashion with a game-ending triple play. The three-outs-in-one-play feat hadn't happened for the Osprey since 2008, and was only the second of the four in club history to come at home. By the way, both triple plays turned at home by the Osprey have come against Billings. - Alex Glenn. The outfielder joined the Osprey only after Ty Linton was lost for the season with a left knee injury, during a freak play against Idaho Falls. All Glenn did was hit .300 with six home runs - four in the stretch run against Billings - and 17 RBIs. Another Osprey stat nugget - Glenn is the first Osprey player since Paul Goldschmidt in 2009 to have a multi-homer game and a walk-off home run in the same season. - Then there's the Glenn walk-off winner, which was set up just three days before in Billings. Mo Wiley, on to pick up a save at Dehler Park, surrendered part of the three-run lead to Glenn, who homered off of Wiley in the 9th inning. In a must-win game three nights later at Ogren Park Allegiance Field, Glenn hit a two-run shot off of Wiley in the bottom of the ninth to win it for the Osprey and keep their playoff hopes alive. - There was also the 7-RBI game from Osprey third baseman Jake Lamb, setting a new Osprey standard in that category on July 29 against Great Falls - the first game of the second half of the season. It set the tone for the half, not only with the Osprey, but with the Voyagers, who lost the first of nine straight games to open the half on that Sunday at Ogren Park Allegiance Field. It would be appropriate that Lamb - who hit .329 with nine home runs and 57 RBIs in the regular season, and also had a Player of the Week honor late in the season thanks to an 8-RBI series in Billings - would lead the offense in the title clincher, hitting a home run and plating four runs. - Then there is arguably the best mix the Osprey have seen of offense and defense in one player in quite a while, and maybe ever at the catcher position, in backstop Michael Perez. The 5th round pick by the Arizona Diamondbacks in the 2011 MLB Draft made an impact at the plate (.293, with a team-leading 10 home runs, 60 RBIs and a .542 slugging percentage) and behind it, leading the league in Stolen Bases Against Efficiency (.523) while leading the league in games caught, total chances, putouts, assists and double plays. Perez finished with the same fielding percentage (.986) as defensive leader Anthony Benboom of Orem. Perez also led the Osprey to the best Stolen Bases Against Efficiency percentage in the league (.457). His eight double plays as a catcher were one shy of the Pioneer League record. The Osprey led the league in defense with a .964 fielding percentage, and had two players - Jake Lamb at third base and Karl Triana among pitchers - lead their respective positions. - It would also be important to bring up the presence of one Evan Marzilli, who made what has to be one of the best catches ever at Ogren Park Allegiance Field during a game against Helena, when he leaped into the air and caught a ball that seemed destined to be a triple, making like he was back at the College World Series. Marzilli also was solid at the plate, leading the Osprey with a .332 batting average, good enough for seventh on the Osprey All-Time Single-Season hitting list. A fractured forearm ended Marzilli's season early, but he stayed with his teammates throughout the final days and the playoff run, seeing the ending that he has experienced before. In fact, for Marzilli, this is the fifth consecutive summer he has celebrated a title of some sort - two high school state championships for Cranston, Rhode Island, two NCAA Division I National Championships with South Carolina (who was turned away this past June by Arizona), and now a Pioneer League title. Probably the unsung heroes of the 2012 Osprey, however, happen to be the pitching staff, which was good enough to carry Missoula early in the season, and good enough when they had to be late in the season. Appropriately enough, the staff had one more feat to handle in Game 82 - hand the ever-potent Raptors their first shutout of 2012. The starters were led by Jared Ray, who was 3-5 and finished the season third in the Pioneer League with a 4.10 ERA, and Chris Pack, who posted the most wins on the staff, collecting a 6-2 won-loss mark with a 5.42 ERA. Pack pitched the Game 1 win over Great Falls in the North Division series, while Ray came back from a late-season shoulder ailment to help bolster the bullpen. Taking his place in the rotation was Chris Thomas, who bounced back from an auspicious first outing in Grand Junction - when he allowed three runs and walked five batters in just 2/3 of an inning - to post a 2-1 mark and a 3.09 ERA for the season, and posted a 2.30 ERA for the Osprey after that outing in Colorado. The bullpen was a unit through and through - even to the point of developing a group walk to the bullpen area or dugout from the clubhouse, either at home or on the road. That sense of togetherness helped the Osprey relievers become the backbone of the team during the late stages of the season. Including the playoffs, the Osprey won 13 of their final 18 games, and the bullpen was one of the reasons why, posting a 4-1 mark with seven saves and a 3.67 ERA, with 101 strikeouts in 68 2/3 innings pitched. 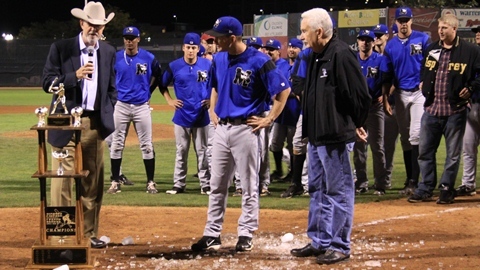 All in all, the 2012 Osprey went through some interesting experiences on the field, all on the way to ending the summer with a dog-pile in front of the pitcher's mound, a cold Gatorade shower for Andy Green, and the club's first Pioneer League title since 2006.